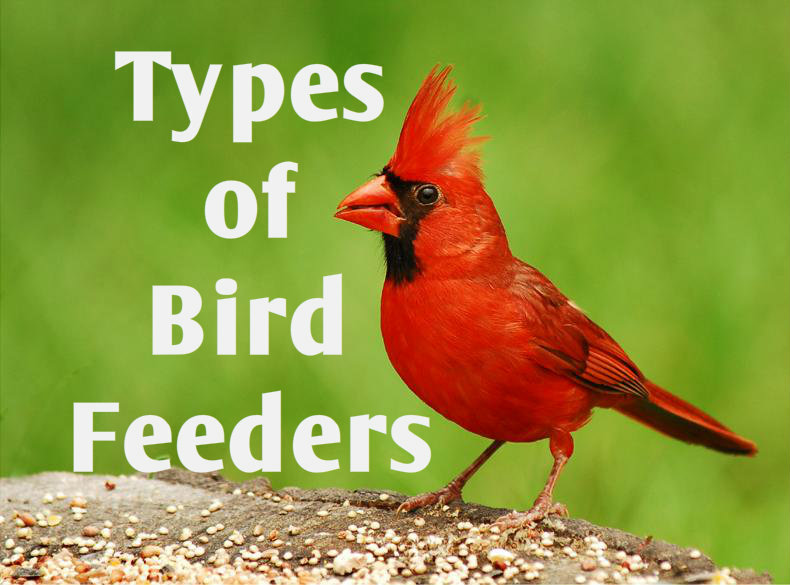 If you are new to the bird feeding community you will benefit from this information. Feeding wild birds is a growing hobby in the United States and for good reason. What better way to witness wild life than right in your backyard with the help of bird feeders. There are many different types of bird feeders, however, you will learn about three here: hopper feeders, suet feeders, and cage or squirrel proof feeders. Hopper feeders, also called house feeders, have a platform upon which walls and a roof are built, forming a hopper. A gazebo feeder is considered a hopper feeder. Hopper bird feeders are popular because they are practical and functional as well as can be decorative. These feeders are efficient to clean and maintain. With hopper feeders it is important to do regularly cleaning. The hopper is built to protect seed against the elements, however, few hopper feeders do a good job of protecting seed from rain, and the seed can become moldy. Birds can eat from at least two sides if not all sides of a hopper feeder, which is why it is so accessible to a large variety of birds. These bird feeders are versatile in a way that they can be set up as hanging feeders or be pole mounted. A good choice of bird food for a hopper feeder is mixed wild bird seed or black oil sunflower seed. A disadvantage to this feeder is that some wild birds will pick through the seed looking for only their favorite and leave the bird feeder a mess and wasted bird seed below. Wild birds that are mostly attracted to hopper feeders are: chickadees, nuthatches, red bellied woodpeckers, mourning doves, cardinals, finches, jays, sparrows and yes the ‘most of the time’ unwanted starlings and blackbirds. Suet feeders are special feeders that hold a nutrient rich bird food called suet. Suet is packed with energy-rich nutrition because of its high fat content. Suet can be store bought or homemade. This special bird food keeps birds warm during cold temperatures which makes it the perfect bird food for winter weather. If used in the winter, place the bird feeder in the shade. Most suet feeders have a wire or plastic cage surrounding the suet to keep it in place and come in many shapes and sizes. Suet bird feeders will attract birds that will not come to other types of feeders. You may start to have problems with starlings or blackbirds at your suet feeder eating all the suet in a very short period of time. If this does happen try using pure suet with nothing mixed into it or use suet only mixed with nyjer and/or safflower seed. An upside-down suet bird feeder where only clinging birds are able to attach to it may work as well. As always make sure to keep this type of feeder clean. Suet bird feeders can attract a variety of woodpeckers, the northern flicker, chickadees, red-breasted and white-breasted nuthatch, purple finch and blue jays, to name a few. Cage and squirrel proof feeders may be right up your alley if you have squirrels in your yard. Believe it or not squirrels can become a problem if you do not have a bird feeder that is designed to keep squirrels out! Squirrels can pose a couple problems including eating all the bird seed and damaging your bird feeders. Most squirrel proof bird feeders are heavy duty yet provide little access for squirrels to get to the seed. Squirrel proof feeders keep squirrels out by making any perch area weight sensitive in the effect that when the squirrel attempts to jump on it they will drop to the ground. Cage feeders allow only birds to have access to the bird food leaving the squirrels at bay. With all the different types of bird feeders out there to choose from, take this information with you when making a decision. 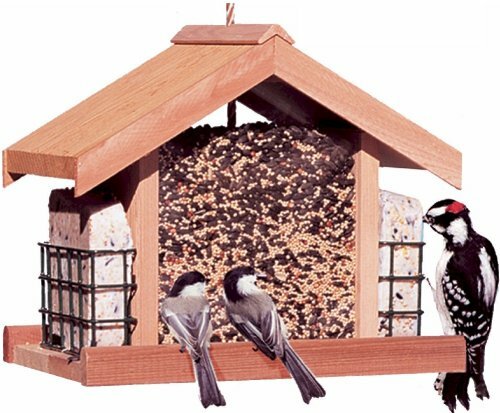 Hopper feeders, suet feeders and cage/squirrel proof bird feeders provide a great selection to choose from. Start enjoying the wild life in your backyard using wild bird feeders. My name is Angie and I love the outdoors. I sell lawn & garden decor from my online store and strive to provide the best quality, low-maintenance, largest variety of different lawn ornaments I can. My online store provides a lot of cute ideas for people to decorate their outdoor space and make it their own. What better way to personalize your lawn & garden than with adorable bird feeders, bird houses, wind chimes, wind spinners and so much more. I love to share my passion for the outdoors and this is one way to do that. There are so many benefits from decorating your lawn & garden and I love providing the products, information, tips, ideas and suggestions for everybody to get started or keep on going.